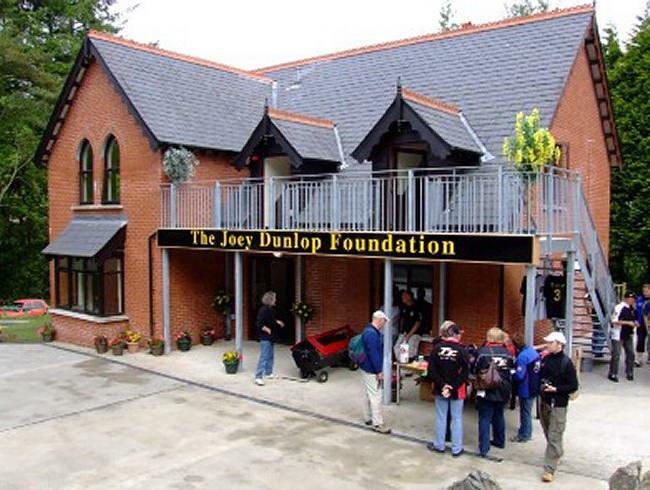 Why are the Team at Joey Dunlop Foundation are looking forward to a busy Winter ? The holiday apartments have been open for 5 years and continue to provide first class holiday accommodation at ‘Budget airline prices for people of all ages and with a wide range of special requirements. With summer occupancy levels increasing by 20% to 80 %( virtually 100% in June, July & August), guests continue to advise the team that our facilities are simply the best in the British Isles which is something we are extremely proud off.
' When the idea of building our apartments were first discussed in 2004, we believed that they would be popular, however demand has far exceeded our wildest expectation., Our facilities are a jewel in the crown for Manx Tourism and we are determined to ensure that the additional apartments will be designed and equipped to the highest of standards but remain available at an affordable price. My volunteers all agree that it is a honour to be involved with Joey's charity and appreciate the support given by event organisers, race teams , riders and of course Joey's family. A major income stream is our annual tombola where you have a chance to win an unique motorcycle, this year the Bruce Anstey replica Honda 600 in Padgetts team colours was a sell-out, the first time in 15 years we have achieved this level of sales. ‘For 2016, Clive Padgett has supplied a Honda 600 which will have the famous yellow and black colours based on Gary Dunlop’s race team colours, second prize is a Padgett‘s team scooter in Valvoline colours’. One of JDF's biggest supporters is DLP who are based in Snugborough. DLP specialise in the design, development and manufacture of products for the assisted living sector, particularly in bathrooms and kitchens. Its products enable people with mobility issues to live independently in their own homes. DLP donated the kitchens and bathroom/shower room equipment in 2010 and have confirmed that further support will be available for the new apartments. ‘Together with a very few helpers and volunteers, I have been involved in JDF right from the outset and it remains an honour to operate and be associated with the charity in memory of ‘Yer Maun.’ Over the years since it started, under the inspiration of Barbara Wood and ably organised on a daily basis by Kevin Quirk. In addition to these two, there have been many others who over the years have been associated with JDF all holding the same determination to ensure that the Foundation prospers in its charitable objects of providing the facilities at Braddan Bridge House as purpose built accommodation for those with disability and requiring special assistance to both individuals and families.